This chocolate cookie completes the trio of crispy cookies made with almond butter and cooked flour. What I like about these is they taste great with crunchy add-ins such as Heath bars and M&Ms. I especially liked the Heath bar add-in because the crunchy toffee worked well with the texture of the cookie. Unfortunately, I liked the Heath Bar cookie so much I ate it and there’s no photo. This one will have to do. Hershey’s cinnamon chips were also a good addition. 1 cup minus 2 tablespoons flour (4 oz) or spoon gently and level without shaking cup – better to weigh. Melt the butter. When butter is melted, add the flour gradually and stir, coating it with butter. Set the timer for 3 minutes and cook the butter and flour mixture in the saucepan for 3 minutes, stirring almost constantly to keep it from burning. After 3 minutes, it will become scraggly. Remove from heat. Transfer the flour mixture to a bowl and let it cool completely. This will take at least a half hour – maybe more. It needs to cool. You can cheat and throw it in the refrigerator after it’s cooled at room temp for 30 minutes. Preheat oven to 350 degrees F. Line a few cookie sheets with parchment paper. Combine granulated sugar, brown sugar, almond butter, baking soda, salt and vanilla in the food processor; process until smooth and creamy. Add the two tablespoons of egg and process until egg is mixed – don’t forget to scrape sides of bowl. Add the cooled flour mixture and pulse until mixed. Transfer to a bowl. If you let the flour mixture cool completely, your dough should be cool enough to add the chocolate chips. If not, you’ll need to let it cool some more so you won’t melt the chocolate. Add the chocolate chips and chunks to the dough. Dough will be ugly and kind of course/grainy/greasy/shiny. It should be thick enough to drop by rounded teaspoonfuls onto the cookie sheet, but if it seems too goopy, chill it for 30 minutes. Drop well-rounded teaspoonfuls of dough onto the cookie sheets, spacing about 2 ½ to 3 inches apart. Bake cookies for 10-12 minutes or until edges are a deep golden brown. Cool on cookie sheets for about 5 minutes, then transfer to a wire rack to cool and crisp. 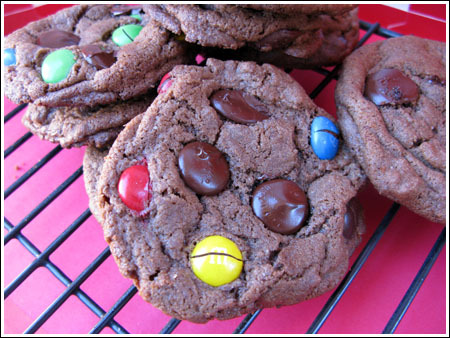 I’m planning to bake cookies with my grandsons this weekend, and I think they would love these! Funny that when you try a new technic you make an oatmeal and chocolate version. I love it! Go “doux” cookies! I like the crackled look of the M&M’s. Tracy, I only put the Heath bar in one cookie. Next time, I’ll do a whole batch. John, I sent all these to Todd’s office. He puts them in the breakroom. Sometimes his co-workers give me feedback, sometimes they don’t. I owe you and Charlie some. Jess, I think stirring the butter around in the pot strengthens the glutens in the flour and that that might contribute to the cookies hardness. The fat (butter) and almond butter plus the sugar probably help the crispiness. So if you used almond butter in a regular cookie recipe, it might be crispy but not as hard. What I like about these cookies is they have a good combination of crispiness and hardness so they taste substantial. Sorry if that doesn’t answer your question. I wish I had Shirley Corriher’s phone number and could just call her up like Alton Brown does. Karen, I think the original chocolate chip and the double chocolate are the best. I’m gonna have to try one of the trifecta, I like trying out new techniques. I think I’ll try the original version. Does the roux always make a crispy cookie, or is it the almond butter?